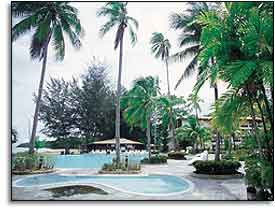 Labuan’s only beach resort . A perfect family get away with numerous water sport activities like diving, snorkeling and fishing. Beautiful rooms, suites, pool, a grand ballroom, boardrooms, the Bunga Mas Restaurant, lounge and bar are just some of the luxuries this hotel offers.